Luxury Hotel Photographer, Founder of Hotel Essence Photography, Keynote Speaker. Passionate about creating quality visuals. Hotel photography is all about visual temptation, you really don´t need to see the whole spa, room, or pool to get the urge to pack your case and go - small, exquisite, detail images, that perfectly capture the essence of the place, can be just as alluring, firing up the imagination and transporting you to that dreamy location. In the luxury hotel market, it's very often the photographs that entice you to click that "book now" button as a hotel photographer, I just love to capture these details on camera. You don´t have to see the entire image to picture the scene of enjoyment, indulgence or restful relaxation; thoughtful, individual little details are there to tempt and tantalize you as potential guests. How fantastic would it feel to be chilling out in that spa/floating in that pool/dozing on that bed, right now? Let me show you six examples of how photography can transport you to paradise. 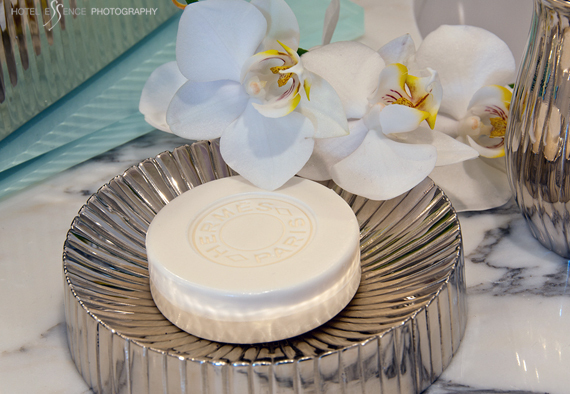 Everyone needs a little pampering - isn´t that what holidays and mini-breaks are all about? Are we really interested in seeing the entire wide angle of the room? A carefully-focused frame can be just as powerful. 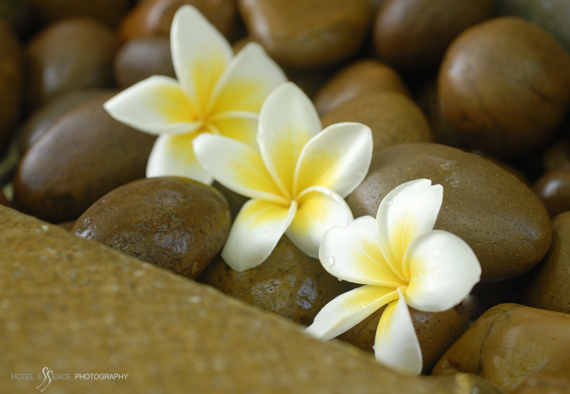 Check out this image of three delicate exotic frangipanis blooms, complete water droplets and warm natural stones. Even the business travelers among us cherish time out in the spa. A hint of crystal-clear turquoise waters will tempt you in - it's like saying "Come take a dip!" - irresistibly inviting. 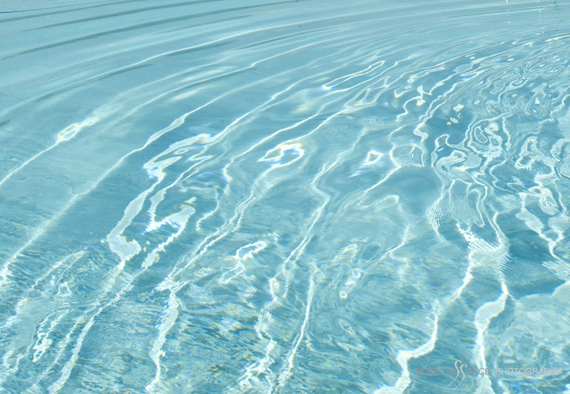 In this case, it's not just the water, it's how the light plays on its surface in ripples, and the movement of the concentric waves bringing the image to life. It also makes you want to see more - intrigue and anticipation can be a wonderful thing. As a rule, luxury branded goodies mean a quality hotel, and if you can see a hint of a sparkling bathrooms, such as this one with its pristine marble tops, delicate orchids and impeccable gleaming silverware, the scene is even more enticing. 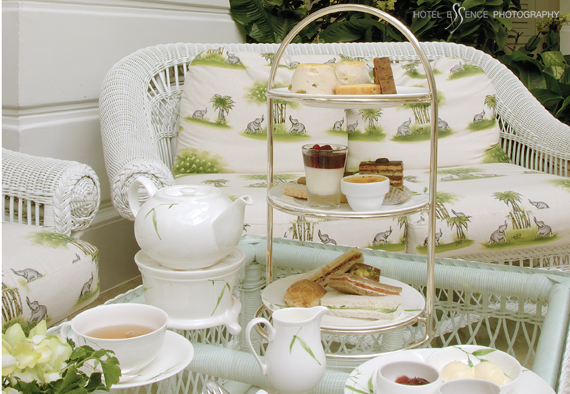 Afternoon tea is always a treat - the hint of colonial furniture and tropical fabrics in this image, combined with the thoroughly British tea pot and the tiered cake stand, shot on location at the Mandarin Oriental Bangkok, is a feast for the eyes (and provocation for the taste buds). The shot marks a special occasion and makes many of us want to travel there, to be sitting on that elephant-patterned sofa, sipping a cup of Earl Grey and nibbling a sandwich. This hotel's afternoon tea is legendary, while nostalgia, a yearning for a former time and place, is also a strong pull on the senses. Beds that you want to dive right into - you don't need to see the whole bed, this glimpse says it all. The privacy of your own personal space in a strange land, the comfort of the spotless, crisp white bed-linen, the cool, clean feeling as you climb in after a long day, the exclusive logo - that wonderful cocooning sensation which a luxury hotel offers. Here you have it, your place to dream. 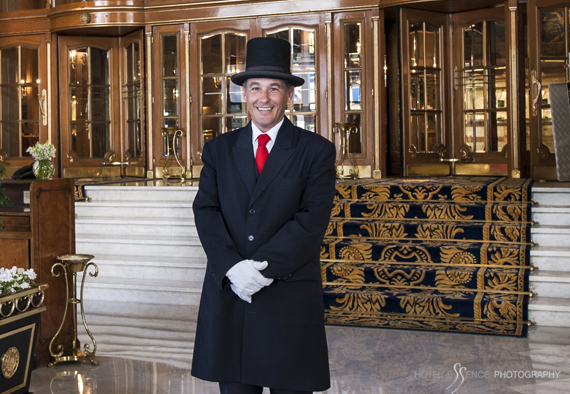 It does not matter how many stars or accolades a hotel has won - there is no substitute for a beaming smile on arrival, to make guests feel at home. That warm welcome, the first glimpse of a hotel, sets the tone for the rest of your stay. In conclusion, a hotel may boast a magnificent historic façade, or striking landmark modern design with stunning reception desks, but images such as these don't give a taste of the real experience of staying at the property. 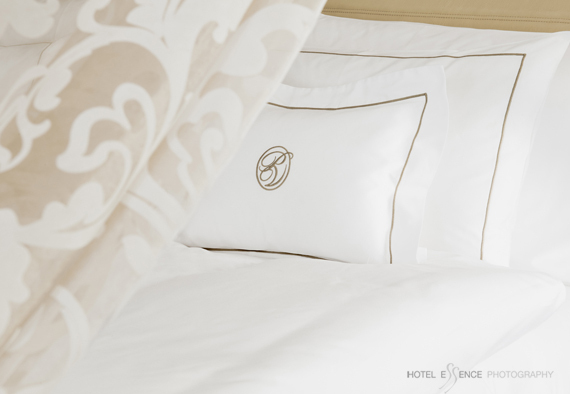 Luxury hotel details can be just as powerful as the "big picture". A fleeting glance of a bed, an entrancing taste of a pool - all photos which will draw you, as their viewer in, capture your imagination and most importantly, leave you wanting more.